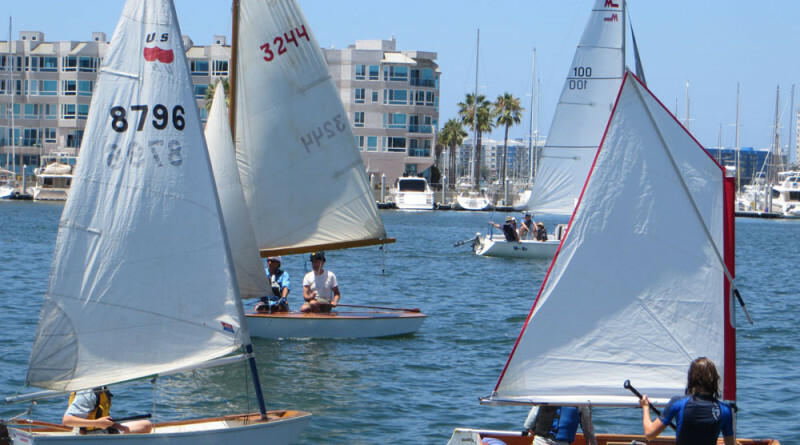 MARINA DEL REY — The inaugural Wooden Dinghy Race got off to an exciting start July 26 as 11 wooden dinghies participated in the invitational dedicated to classic small water craft. The invitational organized by Snipe Fleet 24 Santa Monica Bay and hosted by South Coast Corinthian Yacht Club in collaboration with the Classic Yacht Association, invited all wooden dinghies to participate in the fun. Challengers tested their sailing ability on a course taking them from Burton Chace to the breakwater, while the Junior Fleet races on a course off the UCLA boat dock. A total of four races were held and racers appreciated fair winds of 8 to 10 knots. Held in conjunction with the Old Fashioned Day in the Park, the race drew a mix of long-time wooden boat aficionados and youngsters. Three youth members raced in wooden Sabots and Optimists built and raced by Santa Monica Windjammers Yacht Club members. The oldest participating Snipe was from 1939 and is one of two remaining boats built by the Douglas Aircraft Snipe Builders in Santa Monica, according to the race organizer. The other boats included a restored 1958 Snipe from Clark Boatworks, a 1966 restored Varalyay and a homebuilt Snipe in original 1963 racing trim. Spectators enjoyed the race from the docks, which were open to guests to view the race and board the boats. The Wooden Dinghy Race will continue and become an annual event, each year being part of the Old Fashioned Day in the Park.